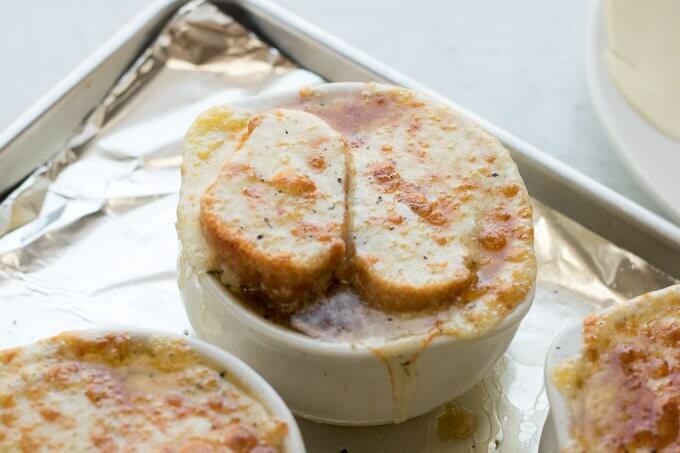 Homemade French Onion Soup: I am a contributor to Amanda’s Cookin’ and this recipe first appeared on there as French Onion Soup. 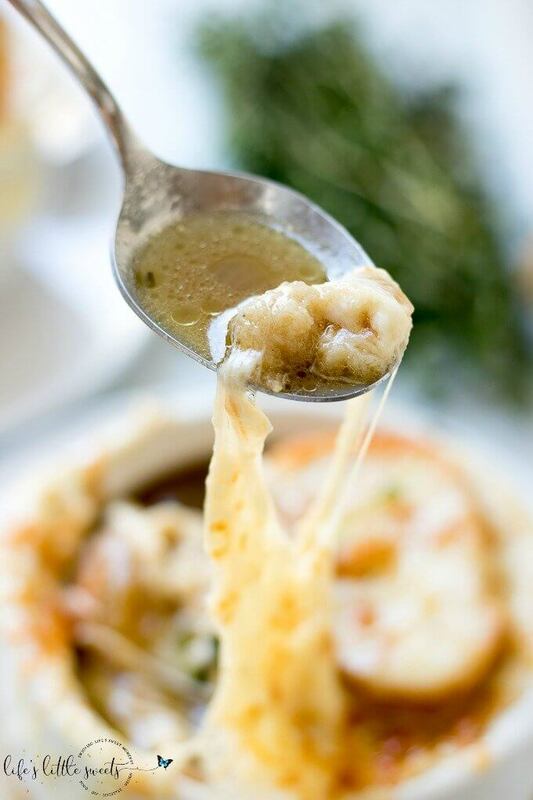 This Homemade French Onion Soup recipe has the flavors of a classic French onion soup that you would find at a restaurant, yet, it is easy to prepare in your home kitchen. 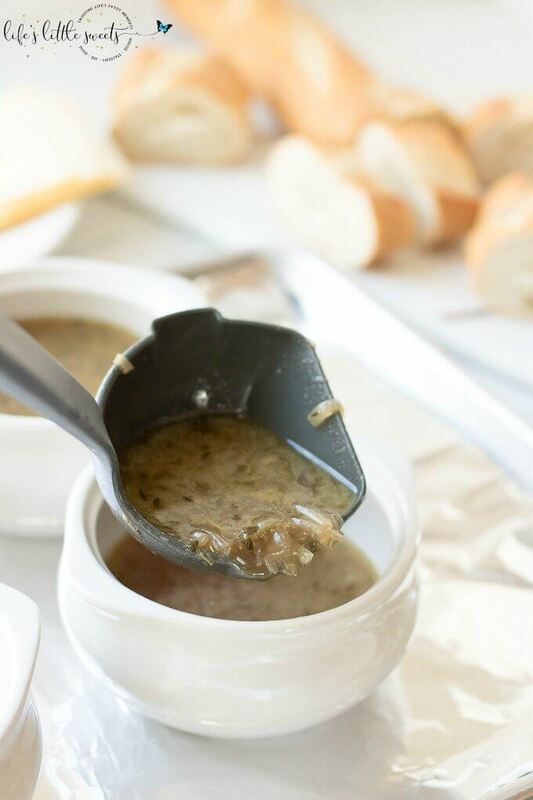 Caramelized onions in a reduction of white wine and sherry with herbs of thyme and bay leaves in a clear beef broth make this soup delicious. 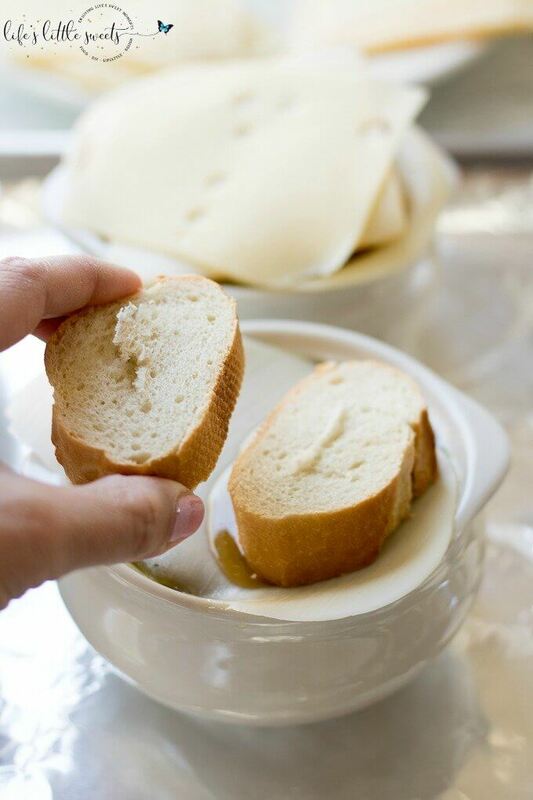 The topping of French baguette bread wrapped in 3 cheeses then melted to a golden, crispy crust, make it satisfying. 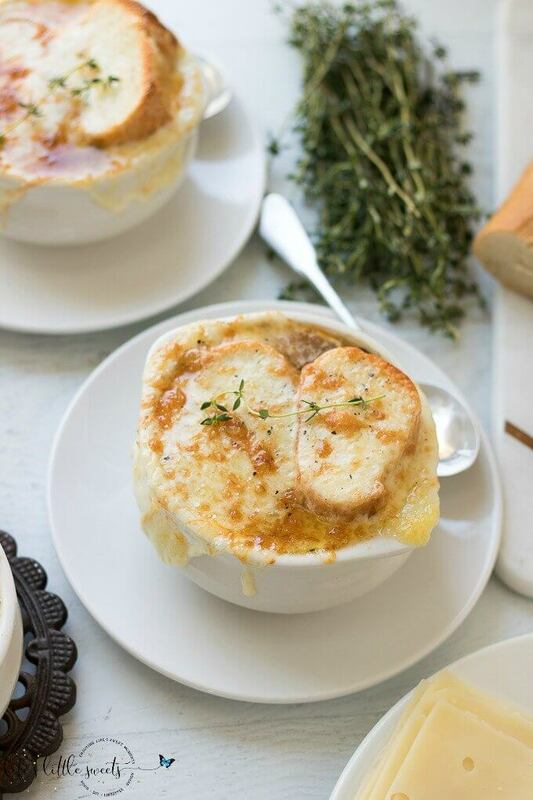 Hi Everyone, I’m so excited to share this Homemade French Onion Soup recipe with you because I have adored, yes, absolutely adored French Onion Soup since I was a child. I would order this soup at every restaurant that my family would go to. I would compare the flavors and think about which one I liked best. 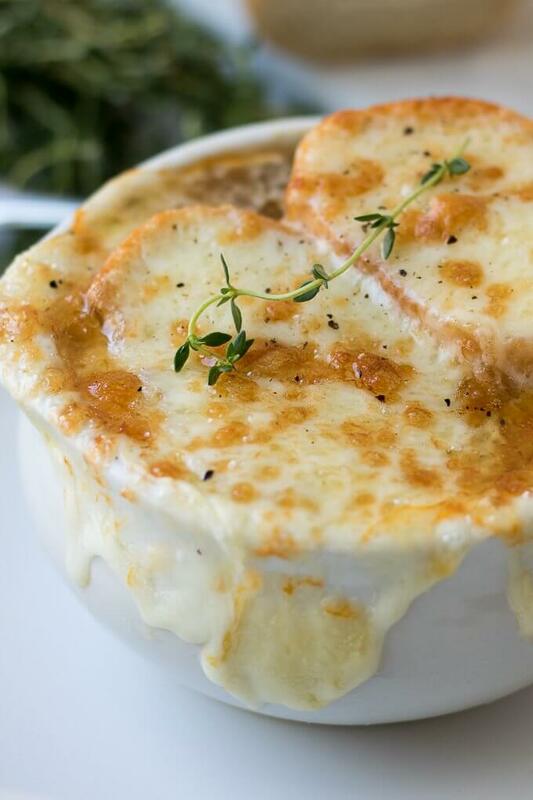 I would pick off the crispy cheese around the ceramic bowl when the soup was finished. 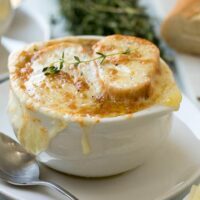 To this day, when my family goes out to a restaurant and orders French Onion Soup, we all critique it and compare it against previous French onion soup experiences. 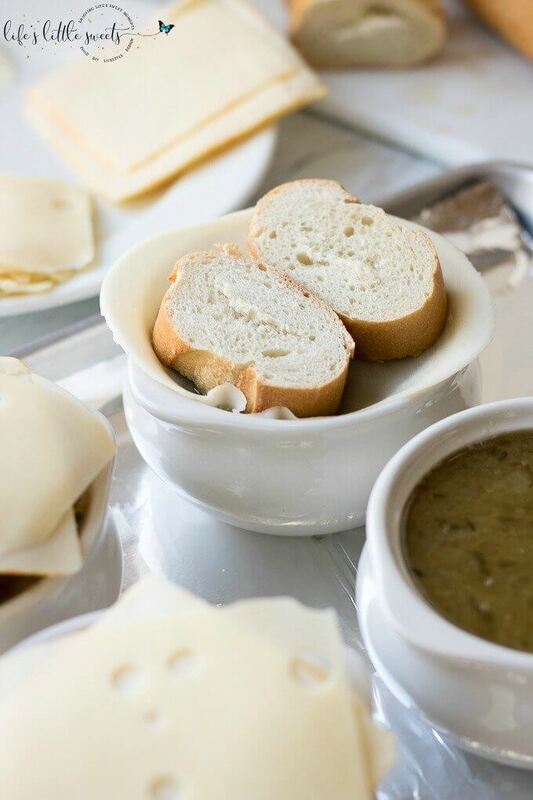 How could a simple soup made out of onions – of all vegetables – taste so good and flavorful? The answer is the combination of ingredients with simple techniques applied: The onions and garlic (my addition, I love garlic!) in unsalted butter with olive oil, the carmelization of the onions, and let those onions be Vidalia onions – if you can get them – the reduction of the dry white wine and sherry (alternately, you can add it in the bottom of the bowl before broiling), the addition of a excellent quality beef broth (I used organic but if you can get your hands on some homemade, go for it! 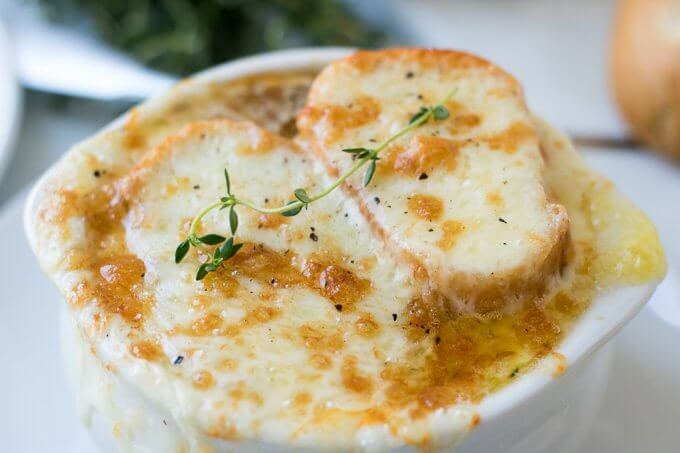 ), the simmering with thyme and bay leaves, I suggest chilling the soup overnight as an option to let the soup flavors settle together, and using a combination of 2-3 cheeses with a crusty French baguette – all these things contribute to making an excellent French Onion Soup! 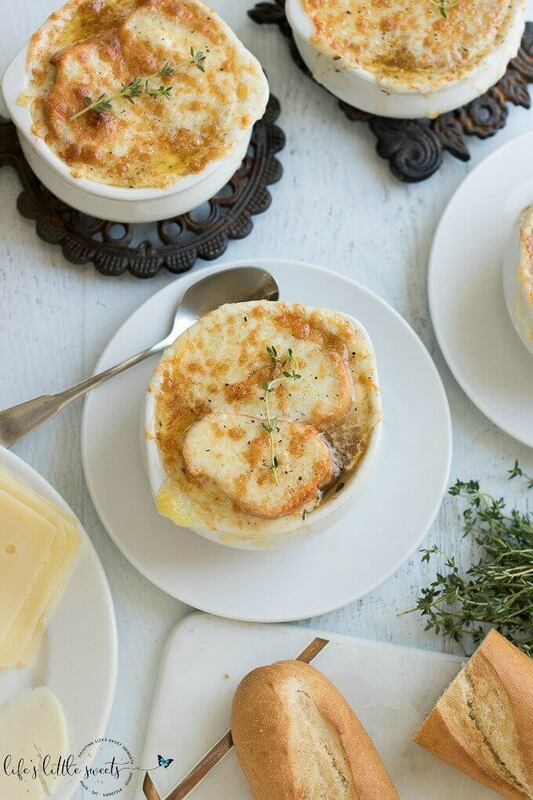 Here are some process photos on how to make Homemade French Onion Soup. The full, printable recipe card is below, at the end of the post. 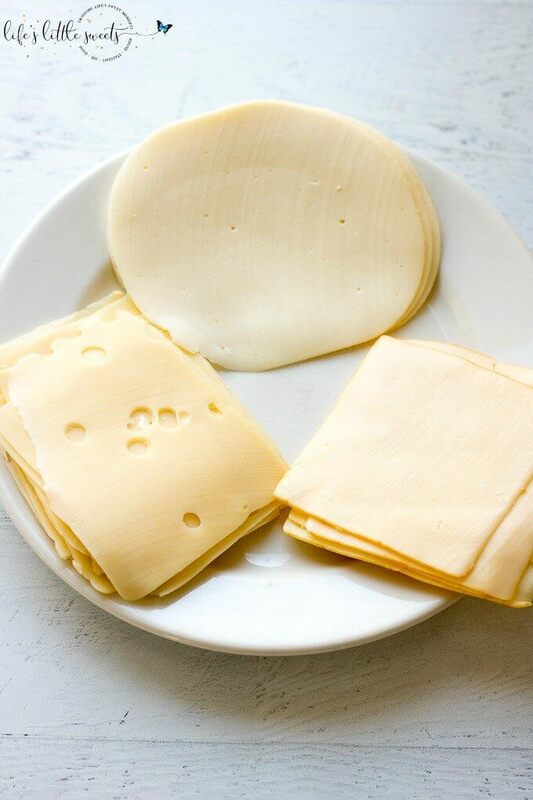 Clockwise: Provolone, Muenster and Swiss Cheese. 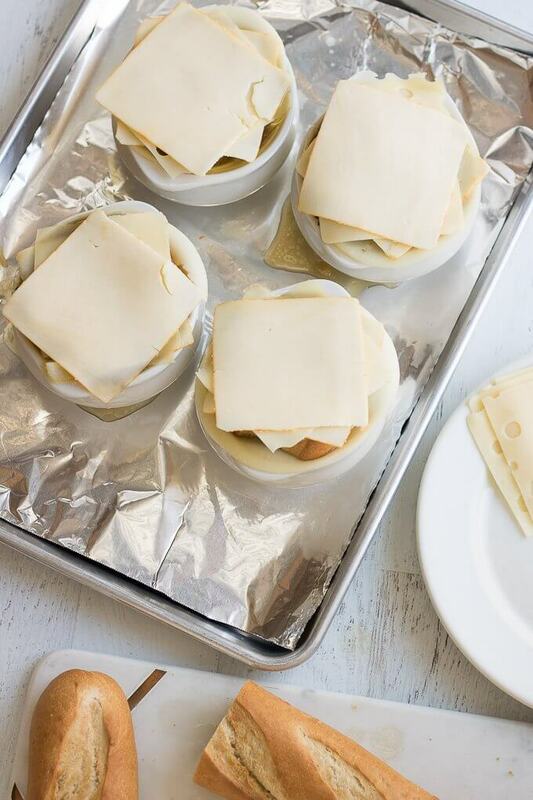 That cheese though, right? Ah, gets me every time! 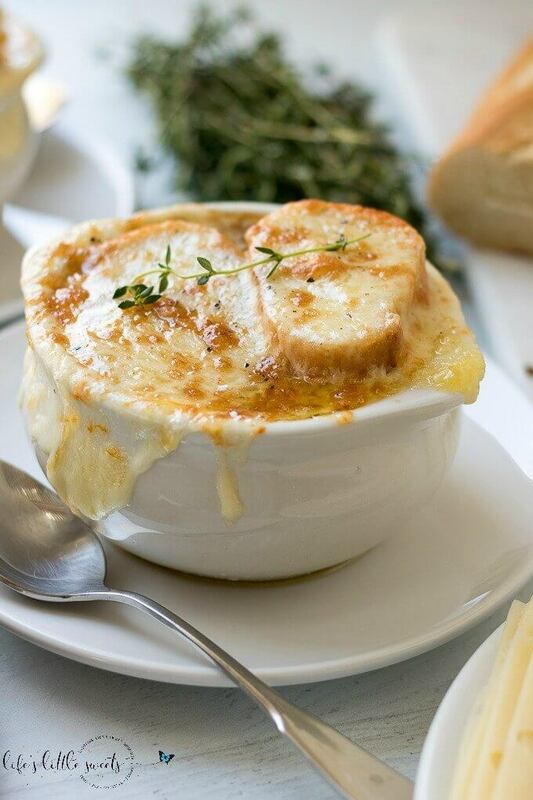 Nothing light a giant strand of stretchy cheese as you hover over your French Onion Soup! 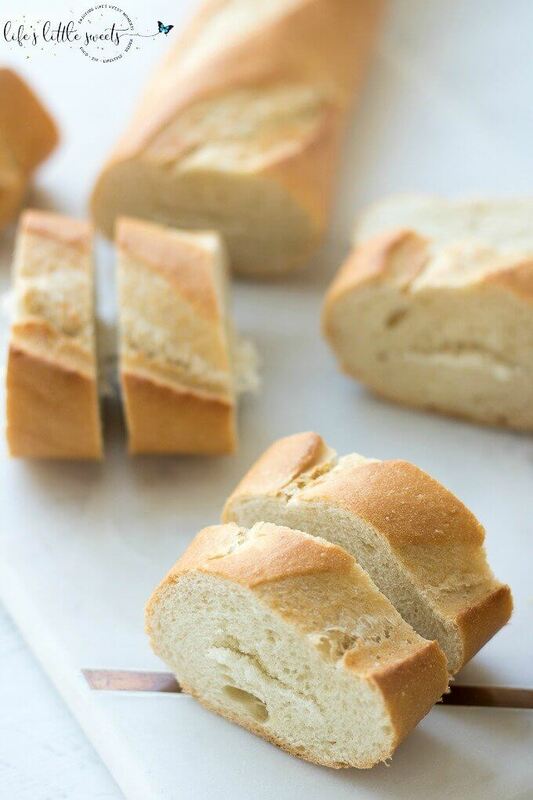 If you want to change the type of cheese, you can also try using Parmesan cheese as well. 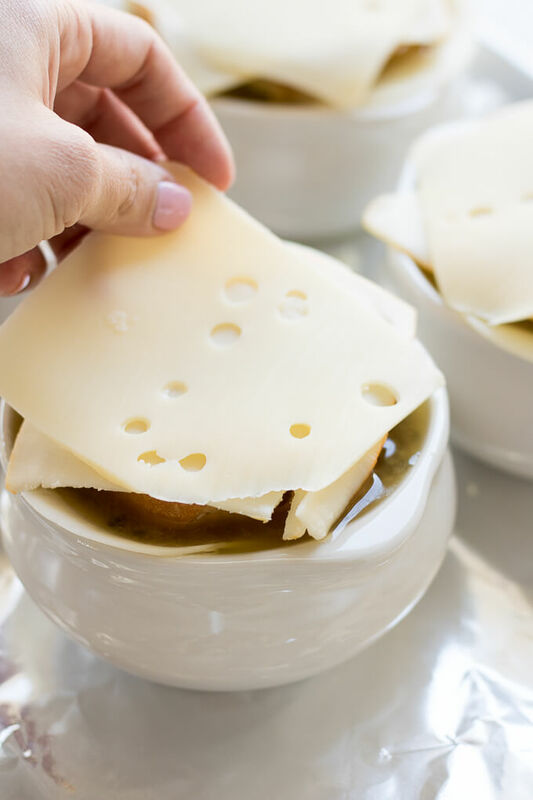 Gruyère cheese is undoubtedly the most traditional French cheese to have on top of this soup but I have found that it can be harder to come by in some places in the United Stapes. Ultimately, you just want a combination of a sharper, more aged cheese with a medium cheese variety to get a nice balance of flavor. 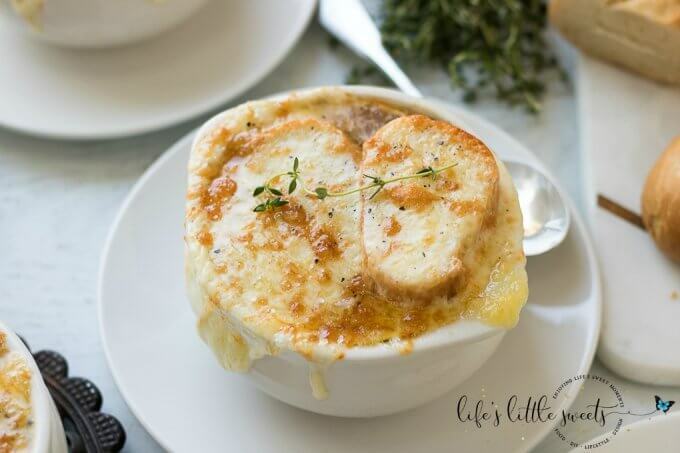 This is one of those recipes that has my heart and soul, it is that good; I know you will love this Homemade French Onion Soup recipe! 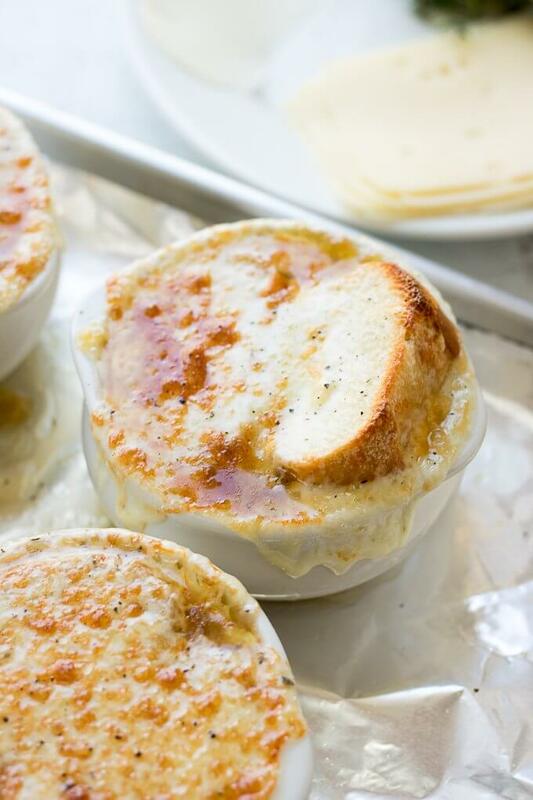 In a Dutch Oven or large soup pot, melt butter and olive oil over medium heat, add garlic and onions. Stir until they are translucent (about 10 minutes). Add salt, sugar and 1/4 tsp black pepper, stir and continue to cook until the onions are a golden brown or darker caramelization, if you prefer (35 minutes). You might need to simmer them longer than 35 minutes, if you want them darker.